David has been trying to get me to Oriental Wok on the first floor of the Regency in Hyde Park for some time now. I always was kind of lukewarm on the idea, until he showed me two things. First, their appetizers, and second, their cocktail list. Oriental Wok is a local chain, having several locations; and is run by a very nice family. It’s also pretty swanky inside. David and I entered and were seated in a nice cozy corner. 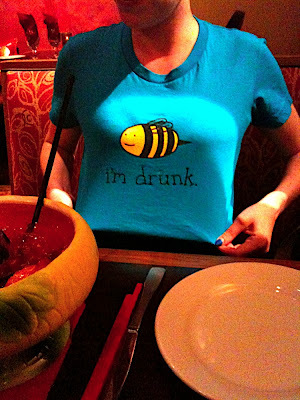 We were pleasantly surprised by the beer selection. David settled for a Brooklyn IPA ($4.50). As you can see, both mainstream beers and oriental beers are present, as well as Canadian brewer unibroue and Salvator, a doppelbock. I knew what I wanted though. 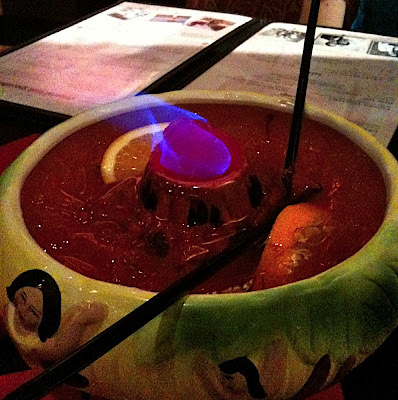 The Volcano Hawaii ($13.00), intended for two people, a tropical drink with a flaming garnish. 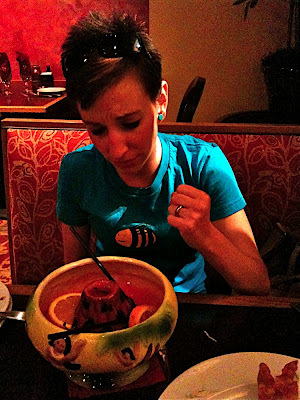 A giant tropical novelty drink? I am all over that. 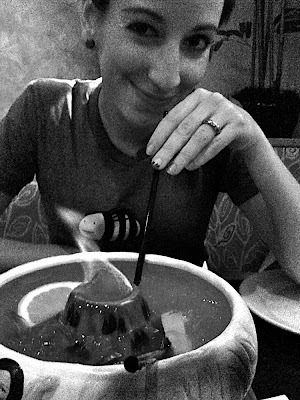 My new iphone can take video, so we have included a short clip of my drink in all of its flaming tropical glory for you. If you turn up the sound, you can hear David giving me instructions on how to take video and my annoyed grumblings. 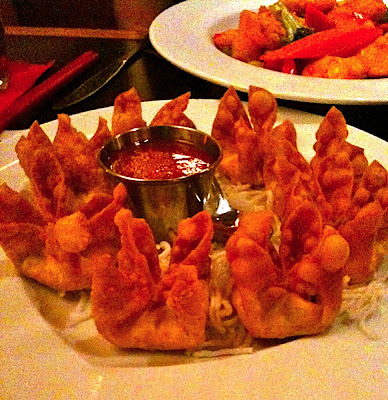 Ever since Taste of Cincinnati, I’ve been enamored with crab rangoon, so I ordered that. ($7.00) They were very tasty and I ate most of them, only allowing David a few. 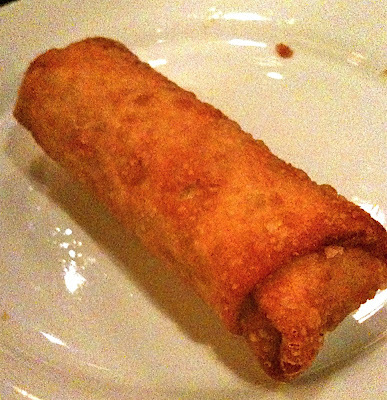 I also wanted to try an eggroll. ($2.00) It was well seasoned, with a little garlic and ginger. I liked it a lot. David’s choice was the volcano chicken, which supposedly was spicy. It had a little kick to it, and plenty of garlic. The chicken was nice and juicy. In the end, I was defeated by the volcano Hawaii. I really like Oriental Wok and I am glad we finally visited. We'll be back for sure, and next time, I'll bring a friend to help with the volcano and share lettuce wraps with. Any takers? Oooh pick me! I want to play! ...though logistically, that would be complicated. Our lab went out for drinks tonight and the big boss lady (who likes beer and scotch) asked me if I had siblings/where they lived. I mentioned you and David and your beer adventures. So now a world famous neuroscientist has heard of you! thanks for your opinion. We really liked it and will definitely be back! I modified the wording a little bit, but having several locations under the same ownership is why I classified it as such. Fuji's House, the happiest place on earth? ...and I didn't set anything on fire. Win.